Licensed Practical Nurses work in collaboration with other members of a health care team by delivering care for patients and their families. As the title suggests, they provide practical care as they assess a patient’s needs and administer treatment according to the patient care plan. They are valuable members of the healthcare team, but unfortunately, their vital contributions are often overlooked. Registered nurses depend on them to take patients’ vital signs, give injections, conduct therapeutic treatments, perform basic medical procedures, and administer medication and immunizations. In nursing facilities, LPNs provide routine bedside care, evaluate residents’ needs, supervise nursing assistants, and develop care plans. More than 10% of Delaware’s LPNs work in physicians’ offices where they perform clerical duties, such as maintaining patients’ records and making appointments, in addition to their duties as a practical nurse. There’s an increase in demand for residential care, which creates more opportunities for LPNs. In patients’ homes, LPNs oversee a patient’s nutrition and teach family members how to perform simple nursing tasks. Delaware’s practical nursing education programs prepare students for a career as vital members of the health-care team. A Board-approved program is the means by which prospective LPNs obtain the knowledge and skills needed to function under the direction of a registered nurse or licensed physician. Graduates are eligible to take the state exam for licensure as an LPN, which will let them provide hands-on nursing care in various healthcare settings. Programs consist of classroom sessions and a minimum 200 hours of clinical experience in a medical setting. Through a series of lectures, presentations, and demonstrations, students learn vital topics, such as practical nursing concepts, medical terminology, foundations of nursing, lifespan psychology, pharmacology and medicine administration, issues and trends in practical nursing, medical-surgical nursing, geriatrics, pediatrics, maternal-child nursing, human growth and development, nursing leadership, functions of the human body, and transition to practice. At the conclusion of the didactic instruction, students will be familiar with the Standards of Practice in Delaware and be prepared to administer competent, ethical, and safe practice. Armed with the knowledge and competencies, students are prepared to provide care, under the supervision of a licensed instructor, during the clinical component of the program. Depending on the facility, students will work directly with seniors, children, and disabled persons. The participating medical facilities will require student nurses to complete a criminal background records check in accordance with state laws. Students who have been convicted of a criminal offense may not be able to complete their studies at the clinical sites. If the student does not complete the clinical studies, he/she will not qualify for graduation. For the selective admissions program, applicants must be 18 years or older, submit a completed application, provide two reference letters and an official high school transcript or GED, and obtain satisfactory scores on the Test of Essential Academic Skills. Once admitted to the program, students will need to submit documentation of immunization, undergo a drug screen, submit a report of a physical exam, and initiate a criminal background check and State of Delaware Adult and Child Abuse Registry check. Liability insurance and CPR certification may be other requirements for entry. Graduates are eligible to take the NCLEX-PN for state licensure. The Delaware Board of Nursing makes the final decision on the graduate nurse’s eligibility to take the exam. Duration and Cost of Training: Nursing education programs are 10 to 12 months for full-time students. Part-time programs are available, and can run up 18 months. Part-time training cost more in the long run. The average cost of tuition in Delaware is $9,200 for tuition. Expenses for textbooks, clinical supplies, lab supplies, CPR certification, toxicology screening, immunization, CBC, admissions testing, and prerequisite course requirements are the student’s responsibility. Financial aid may be available through federal and private loans, grants, scholarships, and in-house payment plans. Contact the school’s financial aid office if you need help covering the cost of training. As soon as you’re ready to take the NCLEX, you should register with Pearson Vue online or by phone (1.866.496.2539). During the registration, you must submit a valid email address to receive communications from the testing service. The Candidate Bulletin provides a step by step guideline for registering for the licensing exam. The registration fee is $200 and is payable using a credit card or debit card. When the Board of Nursing receives, reviews and approves all the documents (evidence of education, fingerprints, a completed application, and application fee), they will notify Pearson Vue that you’re eligible to take the exam. The Board cannot authorize you to take the exam if you did not register with Pearson Vue and submit the application fee. Once the Board deems you eligible to take the exam, Pearson Vue will send the Authorization to Test (ATT) form via email. The ATT should arrive within two days after submitting a completed application to the Board. For queries relating to the ATT, contact Pearson Vue. The ATT contains information that will allow you to schedule the exam. In it, you’ll find your personal data, submitted during registration, candidate ID, and authorization number. Make sure your name and address is correct. If the information does not match the information on your ID, you will not be allowed to enter the testing center for the exam. Make any corrections before the exam date. Schedule and take the exam within the validity dates indicated on the ATT. If you pass the exam and meet all the other requirements for licensure, the Board will furnish your license by mail and send you the results by email – if you submitted an email address during registration. If you did not pass the exam, the Board would send the exam results and an application packet to retake the exam. No results will be provided over the phone. You can retake the exam after 45 days. Delaware’s graduate nurses must file an application for licensure and submit the prescribed fee before assuming the title and role of a Licensed Practical Nurse. An out-of-state LPN with a license to practice in another non-state or territory must also file an application for licensure, by endorsement, before practicing in Delaware. The Board of Nursing will furnish a license to applicants who declare Delaware or another non-compact state as their primary place of residency. Candidates for licensure should successfully complete an approved nursing education program, pass an approved licensure exam, and demonstrate evidence of good moral character. 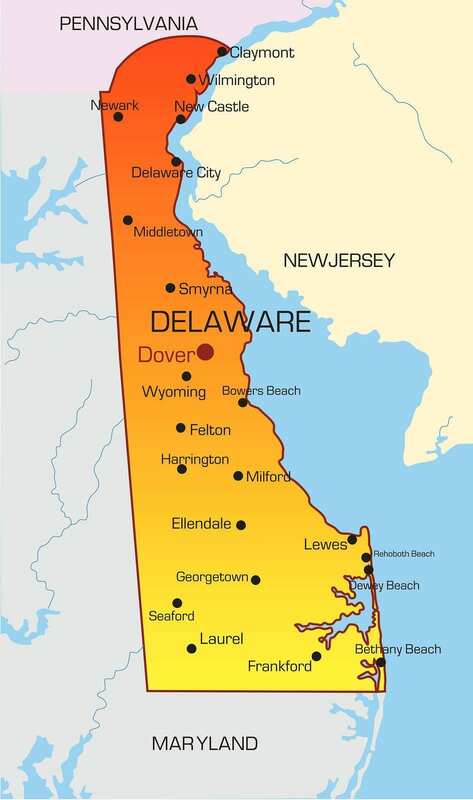 Delaware is a compact state. Therefore, any applicant whose primary residence is another compact state will not be eligible for licensure in Delaware until they can declare a primary residence within the state. LPNs with a multi-state license from a compact cannot apply for licensure in Delaware unless declaring DE as the primary state of residency. If you graduated from an approved nursing program but did not take the NCLEX, use the licensure by examination guidelines below to apply for a Delaware license. Your home state of residence must be Delaware or a non-compact state. The Board defines a home state as a fixed, permanent, and principal home for legal purposes. A completed Authorization for Release of Information form for the criminal background check. The form contains guidelines for submitting your fingerprints for the CBC. A completed, signed, and notarized Application for Licensure as a Practical Nurse by Examination. Make sure to answer all questions. Do not leave blank spaces. If the question does not apply to you, write, “none.” Sign the application in the presence of a notary public. A copy of your driver’s license or official ID from the Department of Motor Vehicles. The state on the ID you provide will be considered as your home state. Submit a voter registration card, military form 2058, or federal tax return of you don’t have a driver’s license or DMV-issued ID. A copy of your CGFNS if you received your nursing education outside the U.S.
Official transcript showing your degree and date received if you completed your nursing education in a U.S. state or territory. The nursing program must deliver a minimum 200 clinical hours and issue a certificate as proof of completion. If you graduated more than 5 years preceding the application date, you are no eligible for licensure by examination. A completed Nursing Reference Form. Complete the application section and send to the director of the nursing program. The school must return the form directly to the Board of Nursing. Your Social Security Number or a completed Request for Exemption from SSN Requirement if you do not have one. Your registration for the NCLEX-PN. Register on Pearson Vue’s website as soon as you’re ready to take the test. You can apply for a temporary permit if you have an offer of employment and submit an application for licensure by exam. To obtain your temporary permit, you must submit a separate Application for Temporary Permit for a Licensed Practical Nurse and the temporary permit fee of $40. Include a copy of your job offer, signed by the employer. The Board will issue the permit within 7 business days after receiving an official transcript of your nursing education, and the criminal history report. The Board will mail the permit. However, you can use the Search and Verify a Professional License online to see the temporary permit number. The permit will expire 90 days after your graduation date. The Board will rescind the permit if you fail the exam. Candidates for endorsement should meet one of the following requirements before submitting an application to the Board. Complete a nursing education program in the preceding 24 months. The approved program should include a minimum 200 hours of clinical experience. Complete 1000 hours of nursing practice within the preceding 5 years (60 months). Complete 400 hours of nursing practice in the preceding 24 months. Complete an alternate supervised practice plan with the Board’s approval. A completed, signed, and notarized Application for Licensure as a Practical Nurse by Endorsement. Make sure to answer all questions. Do not leave blank spaces. If the question does not apply to you, write, “none.” Sign the application in the presence of a notary public. A copy of your current nursing license from another jurisdiction. The license must show an expiration date and bear your signature. The license must be current throughout the application process if you’re not licensed in a compact state. Official transcript showing your degree and date received if you completed your nursing education in a U.S. state or territory. The nursing program must deliver a minimum 200 clinical hours and issue a certificate as proof of completion. A completed Nursing Reference Form. Complete the application section and have a nursing employer or director of a nursing education program complete the form and send to the Board of Nursing. Verification of original licensure by examination. You can verify through Nursys if your state participates or use the Verification of Original Licensure form. The licensing authority should complete the form and send directly to the Board’s office. A temporary permit is available for endorsement candidates after submitting a completed application, temporary permit fee, and a copy of a current license issued by the licensing agency in another jurisdiction. The Board of Nursing will send a renewal notice to LPNs several weeks before the license expires. The notice will be sent to the last known address on record and contains instructions for renewing the license online. It is vital that you keep your records up-to-date by informing the Board when your address changes. LPN licenses expire on February 28 of even-numbered years. The renewal fee, payable using a credit card, will be disclosed at the time of renewal. LPNs must complete the continuing education requirements and work 400 hours in the preceding two years or 1000 hours in the preceding 5 years. The Board will select LPN licenses at random for an audit of their CE and practice requirements. You must send the CE reporting forms and other documents only after receiving an Audit Notice. Your license will lapse if you do not renew by the expiration date. It is illegal to practice with a lapsed license. The Board will renew a lapsed license within two months of the expiration date if the license holder submits a late renewal application and late fee in addition to the renewal fee. The license will terminate after two months, and the LPN will need to submit an application to reinstate the license. The career outlook for Licensed Practical Nurses is a positive one. The profession is among the fastest growing professions in the United States – other healthcare careers are also within this category. A Bureau of Labor Statistics 2014 report projects a 25% growth in employment for LPNs through the year 2022, which exceeds the national average of 11% for other occupations. Delaware’s nursing education programs have been unable to supply sufficient educated and trained nurses to keep up with demands. Although this does not bode well for the healthcare sector, it is certainly good news for graduates who are able to find employment within 6 months of obtaining a state license. Delaware’s retiring nursing workforce and growing Baby Boomer population provide abundant opportunities for new nurses to become active members of the healthcare team in hospitals, nursing homes, physicians’ offices, and home health care agencies. In the past decade, nurses on the verge of retirement held on to their jobs to ride out an economic downturn. Now that things are looking up, there will be a surge in vacancies for LPNs as experienced nurses exit the industry. Employment for LPNs in hospitals is not non-existent as many report. However, hospital administrators are seeking out the services of experienced LPNs, who can fit in seamlessly with the rest of the medical team. The vast majority of opportunities for LPNs are available in nursing homes, long-term care facilities, and patients’ homes caring for seniors and disabled members of the society. The median hourly wage for Delaware’s LPNs is $22.93, and the yearly mean wage is $47,700 according to the BLS. Compared to the nation’s average of $19.97 per hour, Delaware LPNs are fortunate to earn more. The geographic region, the level of experience, specialty, and size of the facility are some factors that influence an LPN’s salary. They have LPN to RN advanced placement at all 3 Del Tech campuses that offer nursing. I’M in the Stanton AP program now. Where is Delaware skill center. Ok thanks but I might go back to New York back to my old job, way more money I’ll come back to delaware one day if God willing ??? Also any good places to get my hair done?